Android Pay has been available in the UK for around four months now, but some major banks have been lacking support. That's changed today though, as NatWest, Royal Bank of Scotland, Ulster Bank and Santander customers are now all able to make use of Google's contactless payment system. To get started just download the Android Pay app and register a card – or check out or full guide on how to use Android Pay. There are still a few banks in the UK with no Android Pay support - most notably Barclays, which has opted to use its own system instead, and TSB, which Google is planning to add support for at some point this month. 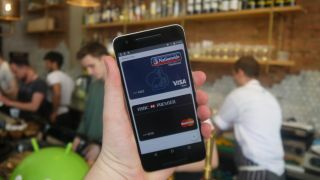 Most other major UK banks, including Bank of Scotland, First Direct, Halifax, HSBC, Lloyds Bank, M&S Bank, MBNA and Nationwide Building Society have supported Android Pay since launch, so if you bank with any of them all you need is the app – and an Android phone with NFC and a newer version of the operating system.